I know I am being redundant and that I already talked about this subject in great detail before, but it just drives me crazy to see people on TV soaking couscous instead of steaming it! Why steaming it instead of soaking it? Well, we want to allow the grains of couscous to cook evenly without overcooking it or undercooking it. This is not the place for “al dente”. Three words for an authentic homemade couscous dish: Steaming, Rubbing and Coating. Steam your couscous in a couscous pot if you are a “couscous freak” like me, or a simple steamer lined with a chesecloth will work. No lid will be needed and the water shouldn’t touch the couscous. Don’t be afraid to rub your couscous between your hands since it is the best and only way you will need to achieve this melt in your mouth texture that couscous is known for. After steaming your couscous, don’t forget to finish it by coating it with butter, vegetable oil or olive oil while continuously rubbing it between your hands. This will help it keep its moisture and softness and will definitely convince you to throw the package directions away. 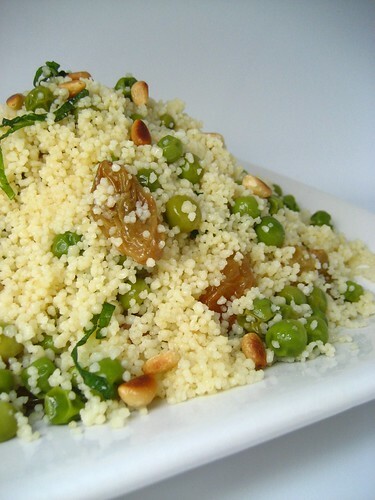 Follow this recipe to prepare the couscous. Steam the green peas and golden raisins together until they are both tender. 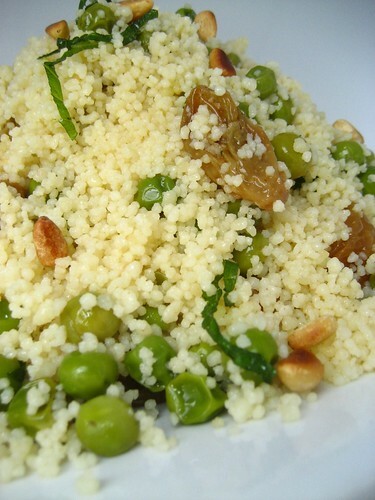 After coating the couscous with olive oil, mix in all the remaining ingredients by using your hands or a wooden spoon. Serve immediately. Suivre cette recette pour la preparation du couscous. Faites cuire les petits pois et les raisins a la vapeur ensemble jusqu’a ce qu’ils deviennent tendres. Apres avoir enduit votre couscous d’huile d’olive, melanger tous les ingredients restants au couscous en utilisant vos mains ou une cuillere en bois. Servir aussitot. Your pictures are just amazing, you even make peas look good and I hate peas. I have never made couscous before, so at least I am not making it the wrong way!! I will bookmark this for when I do make it -I want to make sure and do it right! Great picture. I have the Nigella Lawson all purpose pot, which has a couscousier on top, and you are right the result IS better by steaming. I must confess that I do sometimes just pour over hot chicken stock for a weeknight tea as well! Rose, I'm glad that you are a couscous fanatic because people like me need such precise instructions. Especially since I am trying to "convert" my partner to the wonderful world of couscous. He thinks it's "too dry" but I think it's because he hasn't had one that has been cooked the proper way, like you described. Thank You! Just by looking at your couscous, I know it's uber delicious! Oh, and I love your snapshots, your photos are really great! p.s: thanks for visiting sweet temptations! Un coucous qui me plaît à 200%!!! It looks delicious, light and healthy, Rose. Both my parents were born in Morroco and both sets of grandparents were stationed there for a long time, so believe me I have learned to steam my couscous. I went as far as bringing my couscousier and tagine pot when I moved to the US...don't mess with tradition!